Let Them Henge Cake: Sweet Stonehenge from the Land of Robin Hood! Let them eat cake, that takes the cake, the icing on the cake, the cake is a lie… Cake seems to enter into a lot of cliches, or are they memes now?And those who have been to Discworld have no doubt met Mrs. Cake. There is even a musical group called Cake. Ahem. That may refer to a different kind of cake, but nevertheless… We have a henge to discuss here! “My friend asked me to make a cake for her husband’s birthday back on 28th April and the brief was either a mole or Stonehenge…well there was no choice in my mind, the henge it had to be! We are usually leery of anyone who uses as many exclamation points as we do!!!!! But this someone is given a pardon for having made our highest scoring cake to date. Score: 8½ druids! For more pictures, see here. She has, as she says, paid close attention to the monument as it stands now: where the uprights and lintels and even the fallen stones are, and even better, the shapes of the individual stones. The average person often doesn’t notice, but the stones of Stonehenge are not of uniform shapes, but each has a shape of its own. Ms. Barwell took the time to sculpt each one. Remarkable! We have seen and posted a lot of cakes. You can see the three best here, here and (cupcakes) here. Oh, and this Spinal Tap related one here, cucumber included. They are all pretty wonderful, but this one, um, takes the, hmmm, prize, shall we say. We are pleased to hear that this henge will be preserved, hopefully somewhere away from ants and children. What is it about cake that captures the imagination of the masses? Cakes are made in every shape and size, including pops. People leap out of them, and they play a part in weddings. They are so embedded in our culture, it is no wonder they are well represented in the annals (two Ns!) of henging. We know we will see more, but for now this is the one to beat! !!!! No one matches our use of exclamation points, Sharon, no one! Until next time, sweet friends, keep an eye on the Olympics for hidden henges, and we wish you happy henging! Glimpses of a Carhenge–An Odd Corner of Henging History! “The Secret Life of Machines is an educational television series presented by Tim Hunkin and Rex Garrod, in which the two explain the inner workings and history of common household and office machinery.” So says Wikipedia and why should we bother to reword it just to sound like we’re not quoting it? Friend of the blog Josteyn Ward [about whom we know things you would not want to know about your friends!] posted this video and its henge on the Clonehenge Facebook group along with its partner video which shows a car engine, clearly meant as a sacrifice, being carried into the henge by people clad in white, starting at about23 minutes 45 seconds in. Brilliant! We are amazed that we never heard of this autohenge before now! 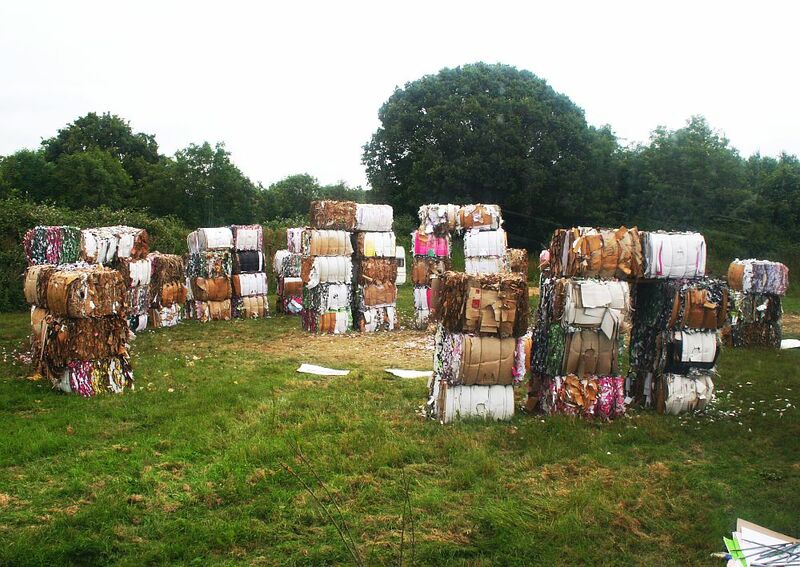 It is extremely rare for a television show to make and feature its own Stonehenge replica. The history of henging has many hidden corners. Score: 8 druids, as much for the procession and sacrifice of the internal combustion engine as for the Stonehenge replica itself! This idea of Stonehenge as a place of human sacrifice persists, but happily it is not taken as seriously as it once was. It makes an excellent basis for jokes. Nothing tickles the funny bone like an innocent person being laid out on a stone and eviscerated before a large crowd! Possibly our friend Josteyn Ward would want to speak to this. Possibly. But we don’t actually want to know. Until the next time friends, happy henging! 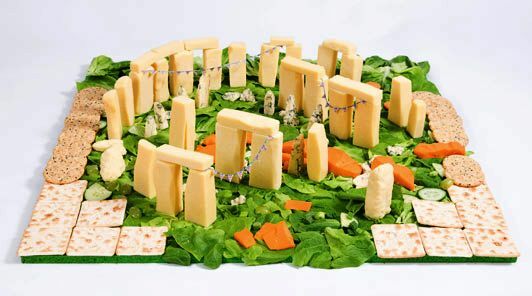 We want to like this cheesehenge by Prudence Staite. We really do. We should like this. Sigh. We order you to like it! Here’s why. It is well done with well-shaped stones. The inner trilithon horseshoe faces the remaining three-lintel stretch, which we always look for. Bluestones are included, and we believe the red cheese represents fallen stones… So much has been done right! We’re not certain what the crackers represent. Aubrey holes? Tourists? Hippies and policemen? And the strings of lights? No, thank you. Still, that’s not what holds us back. Maybe it’s just the angle and the photograph that make it seem so uninspired and uninspiring. We’re not sure. Maybe it’s just that it’s one of those henges that got a lot of publicity, while many brilliant ones get none or almost none. And that as a result we are forced to post it after the fact, just so it is included, even though everyone has seen it already. At any rate, it deserves a good score. We award it 8½ phlegmatic druids. Of the many cheesehenges we have seen over the years it is by far the truest in detail. We really do want to like it! Until next time, friends, get your henges in a row! We Are Not Discussing the Rescue Home for Ducks! Once in a while, once in a great while, these days, we get the urge to post something on Clonehenge like we used to in the olden days. Not sure what brings it on–maybe it’s something we ate. Maybe it’s time to try fasting! On a scale of one to ten, how difficult, nay, painful, do you think it is for us to proceed without devoting at least a paragraph to the phrase rescue home for ducks (henceforward RHFD)? And yet we soldier on! We have, of course, posted a garbagehenge in the past, and a clever, politically-motivated thing it was, set in the city of Montreal. This is in quite a different mood, built by employees of a company run by an old hippie on a recycled chicken farm (we have no idea how one recycles chickens! Harhar!) by people who run a RHFD. And, of course, it is made of materials that are being recycled. Bravo! We’re getting into the swing of this. We may have to post another henge before the night is out. Maybe it’s something we drank! Does anyone know of an old hippie anywhere who might start a rescue home for henges? It may be an idea whose time has come. Remember, careless henging can result in a henge who has to be put down. Henge responsibly!